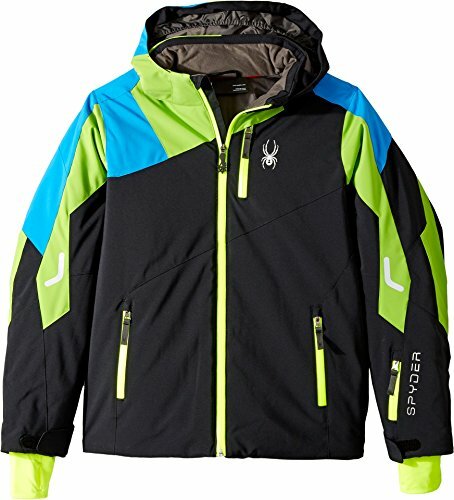 Spyder Kids Size Chart You'll feel like a superhero on the slopes in the Avenger Jacket. Nylon jacket is waterproof and breathable. Xt™ 5000mm coating creates a honeycomb structure of micro-pores that keeps moisture out but also allows the fabric to breath. Spylon™ Water Repellent Finish repels moisture and protects against water and oil-based stains. Maintains a water-repellency of 80% after 20 washings. ThermaWEB™ 140g high-loft synthetic insulation traps and holds body heat. Critical seams taped. Heavy weather hood is removable and conveniently stores in a back pocket. Padded shoulders and elbows add protection if you're carrying your skis or on that “rare" occasion when you might take a tumble. Multiple external and internal pockets for all your stuff. Mesh goggle pocket and chamois lens wipe on shock cord. Internal drawcord at hem and powder skirt allow you to customize your fit and help keep the wet stuff out. Shell & lining: 100% nylon. Insulation: 100% polyester. Machine wash cold. Tumble dry low. You'll feel like a superhero on the slopes in the Avenger Jacket. Nylon jacket is waterproof and breathable. Xt™ 5000mm coating creates a honeycomb structure of micro-pores that keeps moisture out but also allows the fabric to breath.